Frances Usugan with inflated seal gut, Toksook Bay, 1980. In the past, inflating the gut was hard work, but some clever women today use bicycle pumps. Tua-i-ll' maani April-aam tamatum nalliini nutaan camp-ameggnun ayagangluteng, yuirulluteng-llu ukut wani nunat, yuirutqapiarluteng. Then in April they began moving to their spring camps, and the villages became empty, completely empty. Atam up'nerkami arcaqerluteng pissulalriit imumi. Tua-i-ll' tekicata, tua-i wangkuta pissuryaurpailemta ikamrartenguluta qimugtetgun, unuaquaqan tua-i erniyuunata aqvauquriurturluta. Nallunailkutarluteng-llu pissurtemta aatamta pitait; qaralimeggnek piqa'aqluki. Wangkuta nallusciiganaki tua-i ungungssit amllengraata quyungqalriit. Qaralimteggun elitaqluki uciliraqluta ikamranun. Now in those days hunting was done mostly in spring. And when hunters arrived, before we boys became hunters, we'd be the dogsled drivers, and every day we'd get their catch. The seals our fathers caught were marked; they'd mark them with their own design. And even though many seals were there together, we'd recognize the mark. We'd recognize the mark on the seal and load it in our sled. 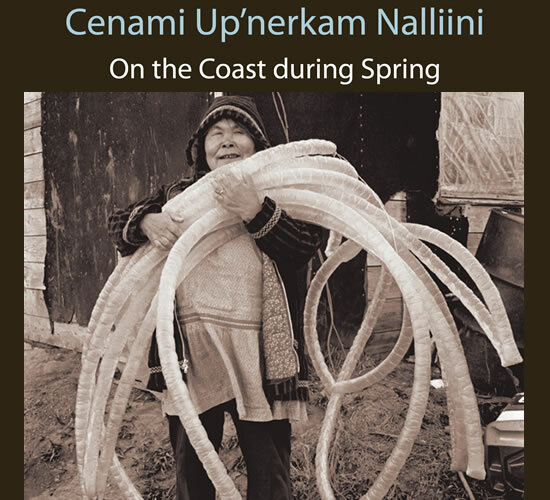 While men hunted on the ocean for seals and walrus, women spent long days at spring camp processing their catch--cutting and drying meat, curing skins, and filling sealskin pokes (containers) with blubber to render into oil.